NEW YORK (Aug. 10, 2016) – The game of beer pong is getting a makeover, as Consumer Goods Veterans and Entrepreneurs Alan Dorfman and Jayson Esterow have teamed up to bring you Pongbot, a new challenging twist on everyone’s favorite drinking game, and it is now available on Kickstarter (add hyperlink). Pongbot is a robotic cup holder that creates a moving target as one attempts to toss a ping pong ball into the cup. This makes beer pong more fun, creative and challenging than the standard of simply throwing balls into a stationary cup that was supposedly, as is rumored, originally introduced at Dartmouth College roughly 60 years ago. Pongbot re-defines the game with moving targets. Players can shoot at a single cup or add a five-cup rack. Pongbot features edge-sensing technology to keep the bot from falling over the edge of the table and has two modes for play; in Auto-mode, the Pongbot will move and spin randomly in any direction at any time so that the shooter never knows where it is going, and in Manual mode, the opponent controls the motion with a tank-style handheld remote control. 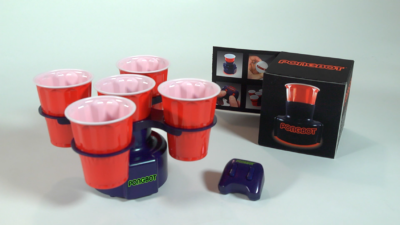 Ideal for tailgating, college or fraternity parties, a backyard barbecue or really any type of social gathering, Pongbot is now available on Kickstarter for a special kick-off price of $39.99 and is suited for all drinking-age consumers. Dieser Eintrag wurde veröffentlicht in Crowdfunding, English, Fun, General und verschlagwortet mit Beer Pong, Drinking Game, Fun, Pongbot, Robot von Sebastian Trella. Permanenter Link zum Eintrag. Do you guys do dropshipping? Sorry, we are not a shop or a reseller. Please visit the Pongbot Website.